Marcin Szczodrowski is the epitome of what has become known as ‘the new Irish’. People who have moved here from overseas and through combining their skills with the resources they found here, have enhanced our culture. 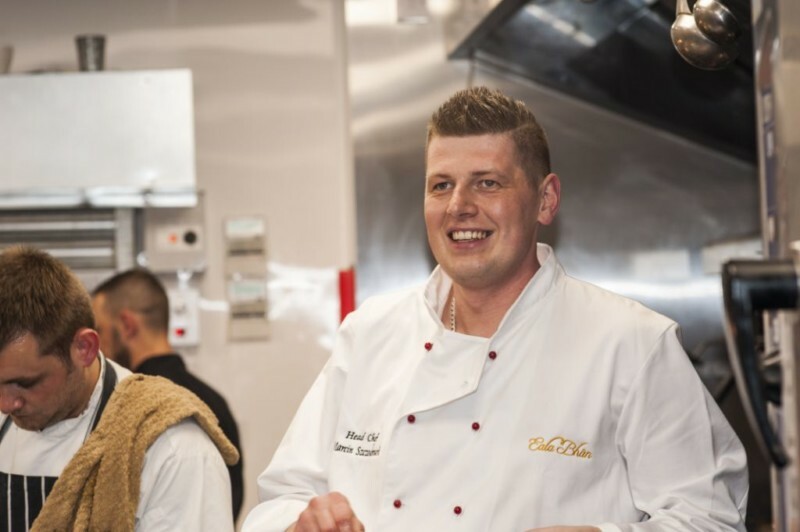 In just a short decade, Marcin has built a stellar career as a chef as well as establishing a settled family life. Poland’s loss was most definitely Sligo’s gain. His birthplace is a historic town called Staragard Galanski in northern Poland. It’s in the province of Pomerania – probably best known as the home of the popular fluffy white Pomeranian dog. From a very young age Marcin has been fascinated by everything to do with cooking and food. He began lessons early, in the kitchen with his grandmother, who was a fine and enthusiastic cook and an inspirational teacher. Today, he finds himself in the role of the teacher, introducing his 7 year old daughter Emily to the world of food and cooking. Through his grandfather who was a butcher, Marcin learned all about meat, how to handle different cuts and use the whole animal, giving him a head start on many other chefs. Unsurprisingly when he left school, it was a natural progression for him to study Culinary Arts at third level and he took to it like the proverbial duck to water. Marcin moved to Ireland hoping to expand his culinary knowledge and develop his career and it proved to be an excellent career move. For ten years he has worked in Sligo, rising to the position of Head Chef at Eala Bhán Restaurant. His flair and attention to detail make his menus stand out from the ordinary. He’s had some incredible experiences along the way, including the privilege of cooking for President Michael D. Higgins, running a pop up restaurant at Catex and winning both the Yes Chef Rising Star and Best Chef in Connaught awards. It’s been quite a decade for the young Polish chef. The quality of Irish ingredients consistently amazes Marcin, who revels in working with them and believes it’s nearly impossible to go wrong! Perhaps he underestimates his own talents. He is strongly committed to working with seasonal products and detests the jarring impact of out-of-season elements in menus. Asparagus or strawberries in January just don’t cut it for this chef. He believes in getting the best out of his ingredients, and to do that they need to be top quality, fresh and in season. French cuisine is close to his heart and he applauds its unrepentant and indulgent use of rich butter and cream, so essential for depth of flavour. He sees authentic food provenance as an essential pillar of his cooking, and particularly enjoys sourcing local Sligo product. Marcin also relishes experimenting and developing recipes, particularly using local seafood like Mullaghmore lobster and Lissadell oysters. A little different than what he would find in his native land perhaps. Healthy cooking and a healthy lifestyle go hand in hand for Marcin. His regular regime includes a daily gym workout, keeping him in shape and ready for the long and often irregular hours in the kitchen. His fiancée Alex and their daughter Emily share his enthusiasm for health and fitness. Already Emily is picking up healthy cooking habits and loves to express herself through dance.